Monarch Air Group provides private air charter in Tuscany, Italy. Our clients benefit from top-notch service, unrelenting dedication to safety, wide selection of aircraft, and years of experience in chartering private jets. To obtain a free quote, please use our online quoting tool provided below, or call toll free 1-877-281-3051. Monarch Air Group provides private jet charter flights in and out of Tuscany, Italy. Tuscany is a region of Central Italy with regional capital Florence, situated on the shores of the Tyrrhenian and Ligurian Seas. This scenic region is well-known for its rich cultural heritage, wonderful landscapes, extraordinary arts, great wine and cuisine. 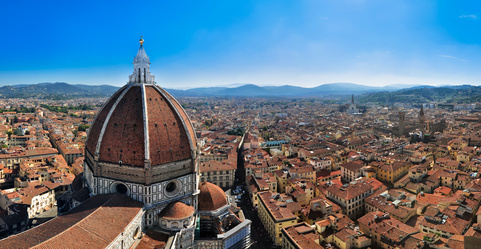 Tuscany is the home to Italian Renaissance and numerous famous people and artists, such as Leonardo da Vinci, Michelangelo, Amerigo Vespucci, Puccini, and Galileo Galilei. The region’s largest cities such as Pisa, Florence, Siena, Prato, and Lucca boast many interesting historic places and art relics. There are a plenty of art galleries, great museums, castles, churches and palaces in the entire Tuscany region including Florence and other major cities. Among many UNESCO World Heritage Sites in Tuscany are the Cathedral Place of Pisa, Historical Center of Siena, Historical Center of Florence, the Orcia Valley, Historic Centre of San Gimignano, and Historic Centre of Pienza. Tuscany is one of Italian enchanting regions, attracting tourists from all over the world seeking for perfect sunny weather, amazing experience, sightseeing in surrounding unique medieval towns, world- known cuisine and wine.